Coyote Blog » Blog Archive » A Third of Welfare Recipients in California? « What Does Pelosi Define as "Immoral" Profits? Greater than Zero? Not surprising. When you dole out tons of aid, and you've got vast areas with great weather, what do you expect? As a result, though it has only about 12% of the countryâ€™s population, Californiaâ€™s share of the total U.S. welfare recipients has risen from 22% in 2002 to 32% today. The state has a whopping 869,000 more people on the dole than it would if it mirrored the rest of the country. There is no defensible reason why Californiaâ€™s caseload should be so obviously and seriously out of whack. Is it because of immigration, legal or otherwise? No way. 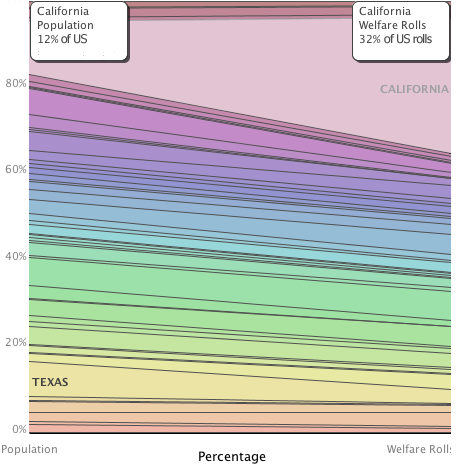 The percentage of the population on welfare in Texas and Florida is less than half of what it is in the rest of the country excluding California. Could it be the stateâ€™s stratospheric cost of living? Nope. While above the national average, the percentage of the population on the dole in New York State, which of course includes the countryâ€™s most expensive city, is only 1.3%. Is it the economy? Nice try; no sale. As shown, welfare rolls have continued to fall elsewhere. Additionally, in the year ended September 30, 2008, the number of TANF recipients in the economic basket case known as Michigan dropped by 16%, or over 30,000. Sadly, it is much more likely that the stateâ€™s political establishment, Democrat and Republican, as well as its social services bureaucracy, have both resisted the fundamental national reforms passed 12 years ago at nearly every possible turn. Misplaced compassion here, and surely in other areas, has ultimately led to the stateâ€™s budgetary brick wall. It's incredible that Californiaâ€™s financial problems can be in the news for months and I have never seen a whiff of this in the media. Particularly incredible given that vast right-wing conspiracy that controls the media. What conspiracy? Give me sources(non wiki) while you're at it.